Fujifilm is moving into the beauty market by launching its own range of anti-ageing creams, Astalift. The Japanese photography company has harnessed its expertise with collagen and antioxidants – used to fix emulsion to film and prevent the image fading – to produce a compound that protects the skin from harmful ultra-violet sun rays. 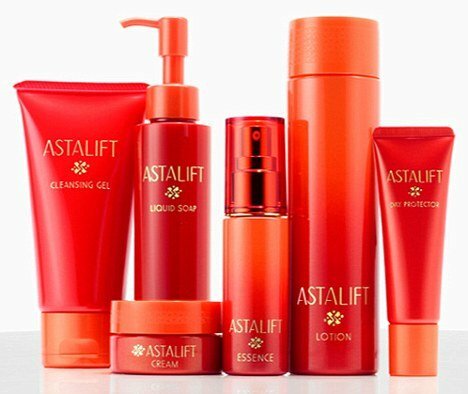 According to Fujifilm, the new Astalift products help to boost skin tone and contain an antioxidant called astaxanthin – a pink pigment found in shellfish and salmon. Scientists from research groups in Europe, America and Asia have recognized astaxanthin as more effective at reducing the damage caused by ultraviolet rays than CoQ10 – the antioxidant co-enzyme that is commonly used in anti-ageing treatments. Andrzej Brylak, director of Fujifilm’s European beauty and health division, said: “Collagen only started being used by the cosmetics industry relatively recently. The transition into the beauty market comes when rival, Kodak, is filing for bankruptcy protection in the United States. The popularity of digital cameras has begun to kill of traditional photographic companies. Rachel Watson, a senior lecturer in aesthetic dermatology at Manchester University told the Sunday Times: “Proving this Astalift product has a benefit will be the key issue. How Astalift anti-ageing creams work? Fujifilm says a special collagen call Pico-Collagen can penetrate the skin through gaps between cells. It is believed to work from inside the skin to restore the skin’s youthful suppleness and elasticity.